When we were young we were told not to cross the road. Curiosity is a dangerous thing and sometimes temptation can get the best of us. Sometimes we listen and other times well, we don’t. Soon enough we get permission to get on it and it becomes the beginning of a wild ride. Fast, late nights, friends and new places. A world opens up and we will never be the same. Ever. We push the boundaries of those limits imposed upon us and we find just how far we can go. And we go. Chasing girls and jobs and the future we think we want and it’s all there in front of us. We can see it just beyond the hood ornament on the car pulling us into our future further than what we’re ready for. Too young to know the difference we continue; we can always ask questions later. The highway becomes such a big part of our lives. It’s takes us to places to celebrate the birth of new life and the end of someone else’s. It gives us a path to our daily grind but doubles as our escape route from it as well. 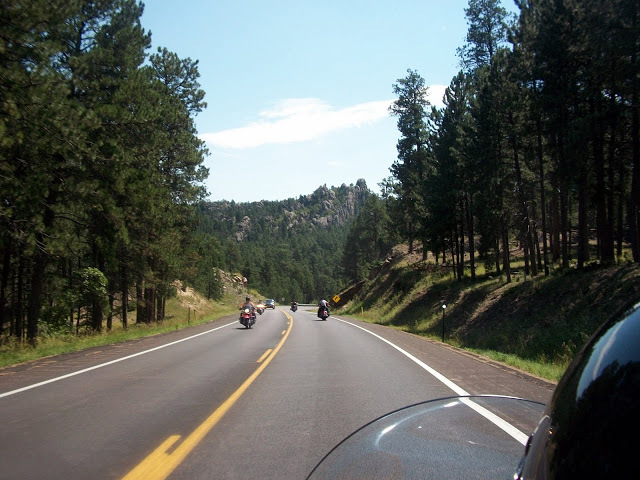 It is our scenic byway and our road from hell and it can be all in the direction you’re traveling. Young and full of ourselves or old and tired of it all, we roll down the road not knowing where it will end. This is the road we’ve chosen and it’s ours. Paved or unpaved, uphill both ways or rocky, put it in drive and floor it. Why not and what are you waiting for? We spend a good portion of our lives looking down the roads we travel. Whether we’re running late or on sabbatical determines how our eyes perceive the road ahead. We all need some down time. You know the kind – the freedom to let our mind and body wander. The absence of a focal point, a desk free of clutter and a mind wide open to whatever. This is why I ride a motorcycle. It’s rare to see someone on a motorcycle distracted by anything other than 3000 pound, four wheel moving objects and an occasional furry friend. Take those out of the equation with a cell phone conveniently turned off and what more could you ask for? Warm, dry weather and a full tank of gas doesn’t hurt either. Well-worn highways and beat down back roads. If you were to take one or the other, which would it be? It doesn’t really matter as long as the direction you’re going will get you to where you want to go. We all have a reason to be on the road. We share it with people just like us, looking to get to work or chasing a dream. And if it’s a hood ornament or a headlight you look over as you stare down the highway just remember that day long ago when you hit the road for the first time, and the freedom you felt. The windows down or wind in your face isn’t something you forget, in fact it’s something we desire. Just put it in gear and go.